The iGorot Preacher: What Good Does a Title Provides? What Good Does a Title Provides? Recently, I attended the International Council for Higher Education (ICHE) annual conference held at the Green Palace Hotel in Phnom Penh. 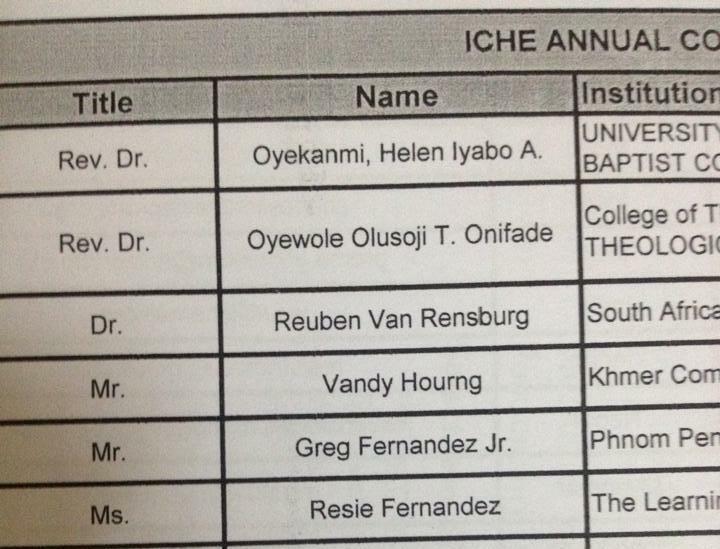 The title "Dr." and "Rev Dr appear" beside each delegate's name listed in the program looks intimidating at first glance. 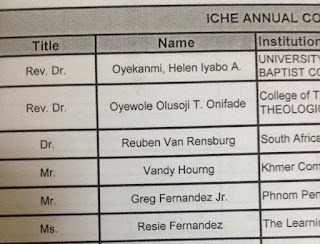 Well, I also have doctor of theology but it's a non-formal one, from The Open Seminary. Although some of my friends are using it, I never used did because it's not academic and does not seem real. The Open Seminary (TOS) is a non-formal,interfaith,and inter-disciplinary continuing education program that awards bachelor, master and doctoral degree by acknowledging the years of service of the individual applicants. Perhaps it's time to pursue my doctorate. But pursuing a doctoral studies for title sake is worthless and futile. The motivation must be higher, and that is for advance learning. Let us not forget also that one of the prevalent reasons people study or pursue a degree is for career opportunity. Jobs available are geared to one's specialty or mastery. One cannot be hired as surgeon if he does not have education in that field. Thus, pursuing education is also motivated by career dream and ambition. To be honest, I would like to take up my doctorate for credentials, future ministry and personal development.